10/3/16 8AM Update on Hurricane #Matthew: Still a Category 4 major hurricane with winds at 130mph, pressure 943mb’s, heading N at 6mph towards western #Haiti and eventually up through eastern #Cuba. Looks like #Jamaica may get spared the stronger core winds. Hurricane Warnings are up for all of these areas. 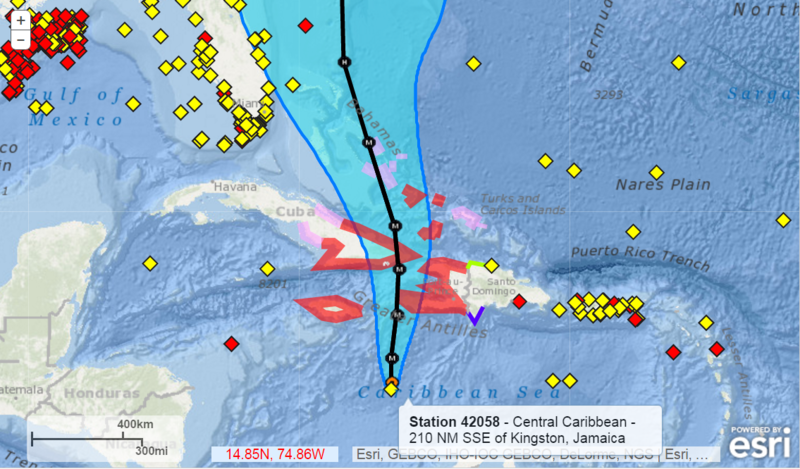 Beyond Cuba, the northward track takes it up into the Bahamas Wed through Thursday while still maintaining major hurricane status – estimated Cat 3. 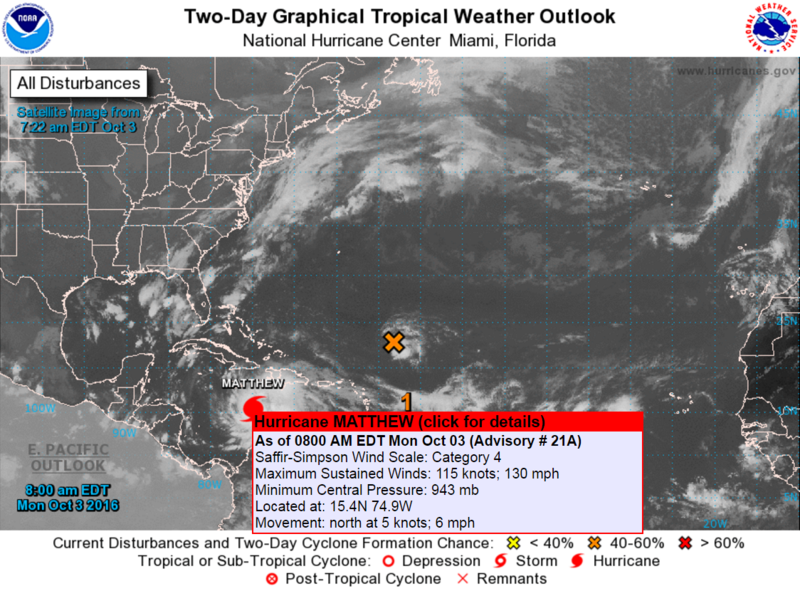 The system could weaken to Cat 2 status once pushing into the northern Bahamas and beyond. 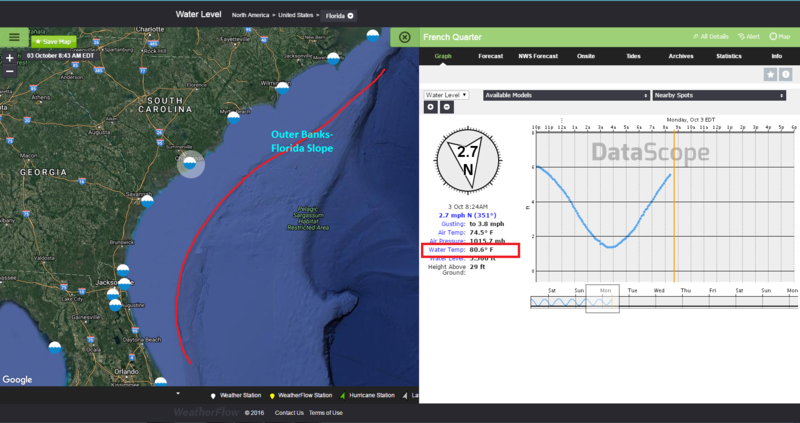 At 5 days out, we are still uncertain of the degree of nudge towards the SE coast from Bermuda High pressure and northern High pressure, but for now model guidance is keeping it very close to northern SC and southeast/OBX NC. We will need to watch peripheral patterns very closely to see just how much of a westerly nudge it may receive…or how fast a pull out to sea may happen. This is a timing issue with forward speed and overall system patterns once it enters the heart of the Gulf Stream off the FL coast, where sea surface temps are still very warm near ~86°. 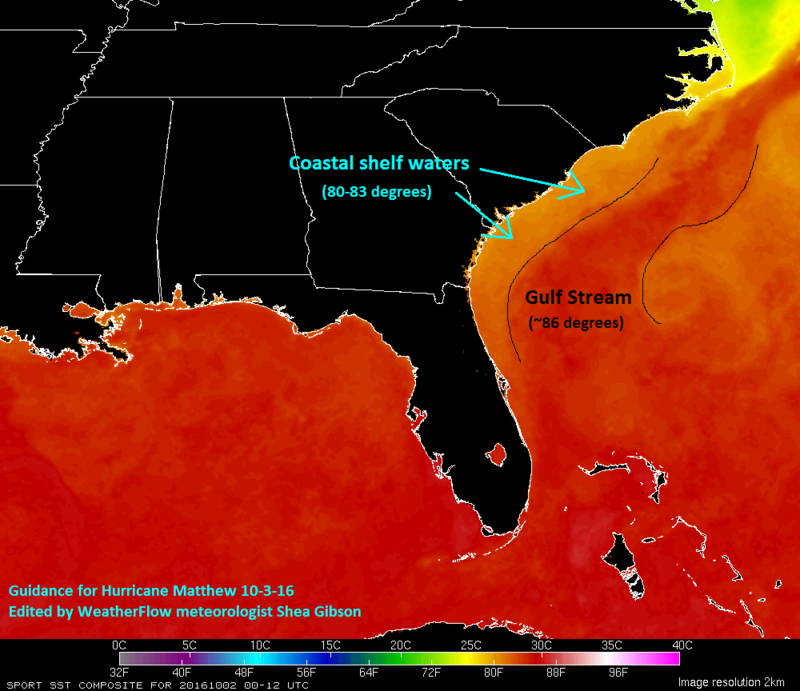 Cooler shelf waters are between 80-83° west of the Hatteras-Florida Slope and into the coast (see below graphic). Here is the NASA Sport SST with edits to show the features. The chances are slowly increasing that we may see some outwards effects from this storm along the SE coast. Expect in the very least strong rip currents and higher than normal swell heights. 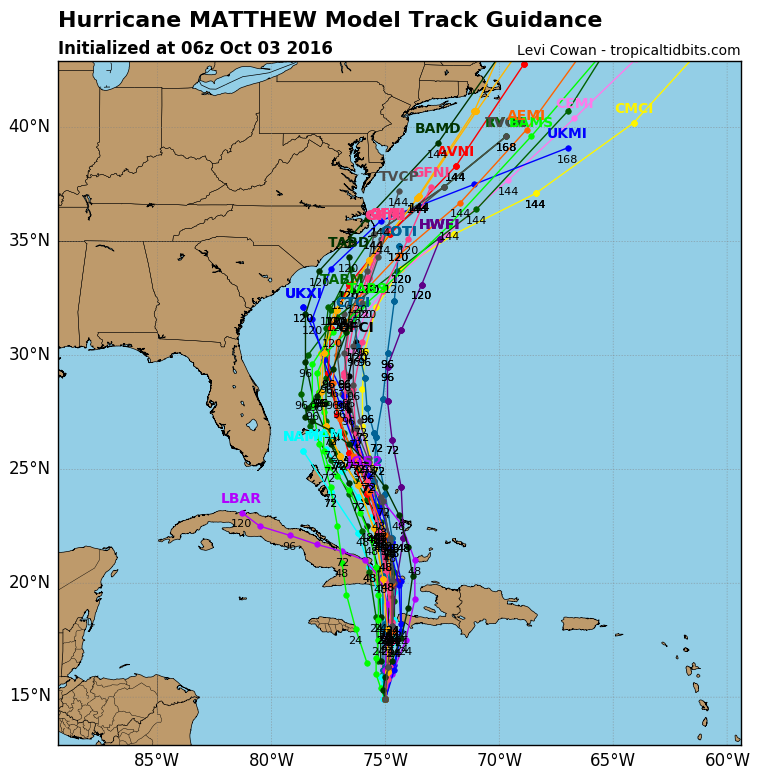 We could see strong winds by late week and into the weekend depending on the track of Matthew. Moderate NE winds may pick up by mid week due to increasing pressure gradient with High pressure to the north and troughing near the SE coast…and may continue to build from there with the outward wind field increasing. 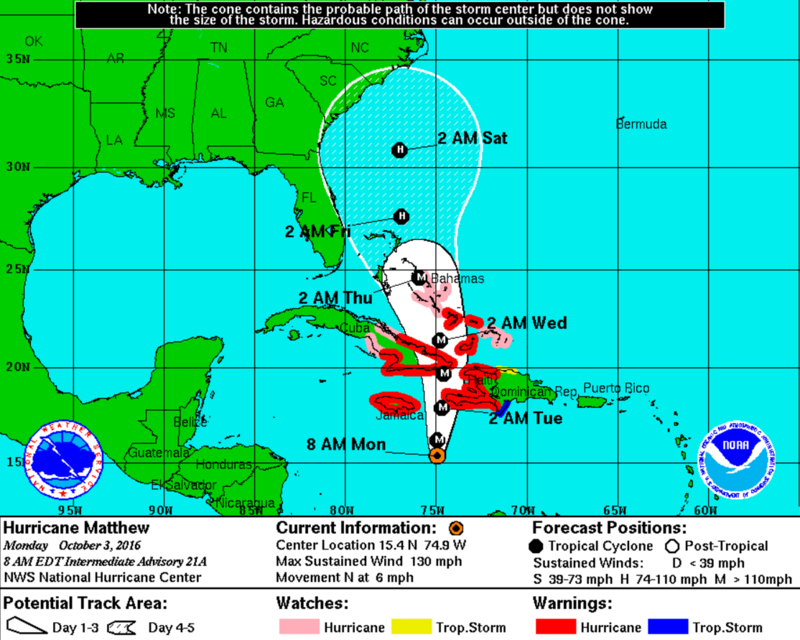 We’ll have a much better idea once it passes through Cuba and heads towards the Bahamas. 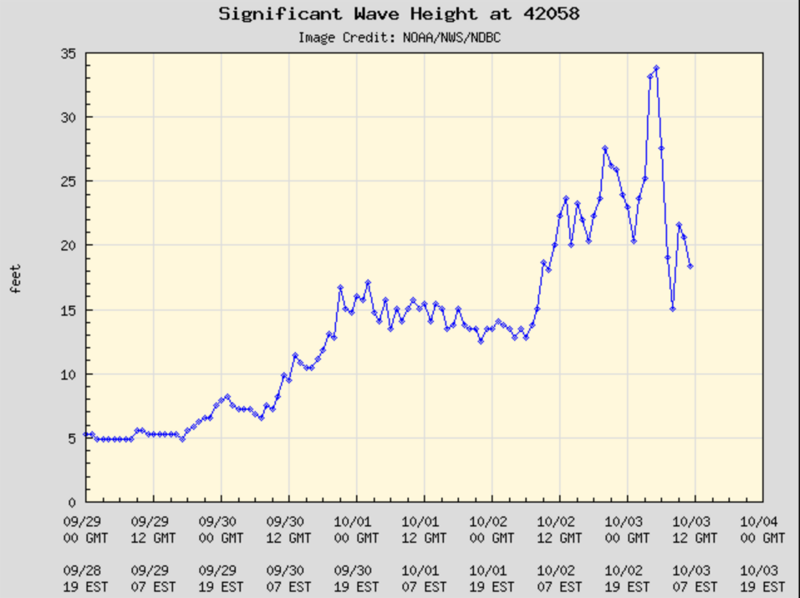 By the way…check out the 34ft waves Matthew kicked up at the Central Caribbean buoy while going over it. And the cool water upwelling due churning of the waters. 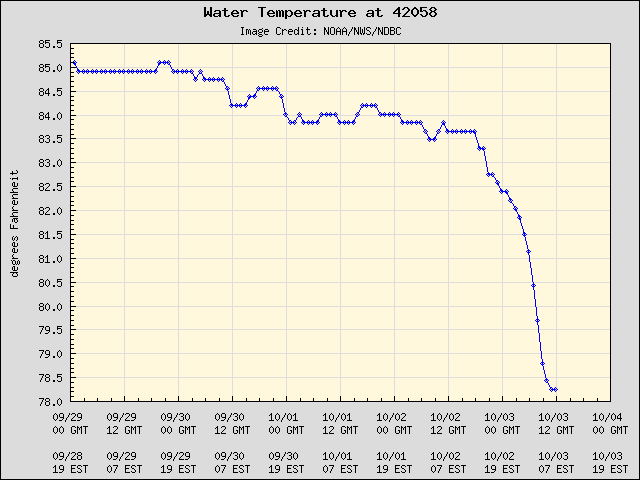 Notice about a 7 degree drop in water temps.